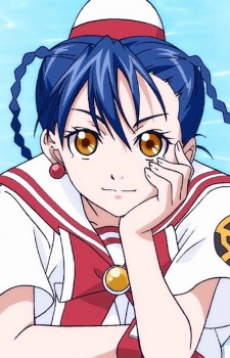 The first friend Akari ever made on Aqua, Aika is an undine for Himeya, the oldest and currently second-ranking water-guide company in Neo-Venezia. As the only daughter of its owners, she is also Himeya's heir, but does not enjoy the distinction that much, as she feels that she is fawned upon too much by the company's employees. Aika often speaks in an open and blunt manner, and goes out of her way to cut off Akari's many idealistic comments with a preemptive "Embarrassing remarks are not allowed!" (恥ずかしいセリフ禁止! Hazukashii serifu kinshi!). Despite their contrasting personalities, she gets along quite well with Akari, and later with Alice. She is very proud of her undine abilities, and tends to be very competitive in this aspect. She also worships Alicia, and finds any excuse to go over to Aria company and spend time with her. Aika once said that if it was not for the obligation to her family, she would join Aria company. Aika has feelings for Al.